Smallholder farming in Zambia has been negatively affected by low agricultural productivity due to declining soil fertility and land degradation caused by unsustainable agricultural practices and the adverse impacts of climate change and variability. In recognition of these challenges, the government and other stake-holders in Zambia have been putting up measures to address these problems by investing more in sustainable agriculture and Climate-Smart Agriculture practices such as Conservation Agriculture and Agroforestry. Over the past three decades, Conservation Farming has been vigorously promoted by the government, donors, international agencies, NGOs and other stakeholders in Zambia. Despite several years of promotion, the adoption of Conservation Farming practices by smallholder farmers has been generally low, whereas non-adoption and dis-adoption of this farming innovation have also been reported. This study was undertaken to examine the factors influencing the adoption, non-adoption, and dis-adoption of Conservation Farming among smallholder farmers in Zambia and to understand how peasant farmers make their decisions regarding the adoption of Conservation Farming practices within their socio-economic and agro-ecological contexts. The study employed the cross-case study methodology to collect and analyse both qualitative and quantitative data by reviewing several single-case studies and making comparative analyses between cases. 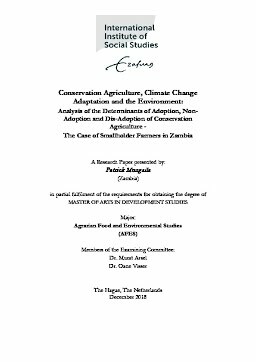 This study has established that the factors triggering adoption, non-adoption, and dis-adoption of Conservation Agriculture in Zambia are caused by a convergence of determinants mainly agro-ecological, institutional, socio-economic and cultural contexts of smallholder farmers in Zambia. Household characteristics such as age, gender, household size, land size, and household assets tend to have positive influences on the adoption of Conservation Farming among smallholder farmers. Therefore, this study argues that future Conservation Agriculture projects could benefit more smallholder farmers by addressing the major constraints to full CA adoption which farmers are facing, in ways that take into account their socio-economic and cultural contexts as well as smallholder farmers’ adoption decisions.